'Boring' Singapore City Photo: Ugly or Pretty Feet? My colleague walked into my office this morning to show us these weird shoes! Immediately I said, I seen those before! But are they comfortable? He said it is, I think they are not. He has been going for runs in it and his ankles and knees don't hurt anymore he says. We ended up talking about benefits of simulating bare foot walking and fully padded shoes. I like padded shoes. We can't conclude which is better though. If you are wondering what the above are called, they are Vibram Five Fingers. We wondered why not Five Toes? I got FitFlops for my birthday and I think they feel better. Any FitFlips fans out there? 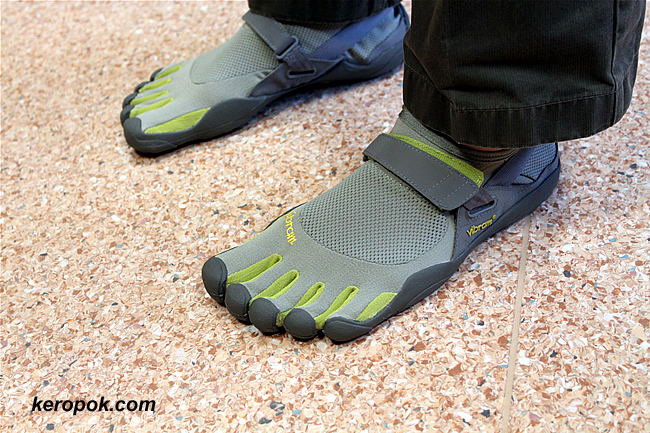 Or Vibram Five Fingers fans? I've never seen anything like these. I'd give them a try. Funky, weird, unique and strange all wrapped into one pair of shoes! I don't know what FitFlops are. You'll have to show us. These look very weird indeed. They don't look very supportive. Only if you like to walk barefoot. :-) It has that feeling. He looks like an alien ya? Oh, they are a hit in many countries it seems. After it went on Oprah Winfrey's Show. Hmmm. Ya, now that you mention it! Those shoes look like they belong on a deep sea diver. Vibram Five Fingers? Sounds like a friend of Al Capone! Had to google FitFlips - they're called thongs here and are (almost) a national icon. And yes, I love my thongs, best invention ever. lol,this is very weird looking indeed. how much does it cost? bet it can be pricey..
Where can we find them in Singapore? haha. ya, do sound like a friend of Al Capone! I think I saw them at Novena Sq (Velocity) once. wow! They look weird, I wonder if they will take off? I have a pair of 'fit sneakers' that I love a lot more than normal sneakers, I think they have improved my posture.